In the drama party, Robert is narrator and musician for an instant drama acted and danced by children. Party guests show their stuff by auditioning for parts in musical stories and then acting the parts. Robert is emcee, narrator, and one-man band. The auditions are simple and humorous free-style dances. In auditioning children for the "Witch" Robert plays rhythmic rock n' roll and asks guests to use their arms and legs to put their most powerful spell on him. In the audition for "King" Robert plays another rhythmic tune and asks the guests to dance like a monkey (since the Witch turns the King into a monkey). There is a part for everyone, and some of them are "group parts" for children who feel more confident operating in a group. In the photo above, children are "animals" in one of the drama pieces. 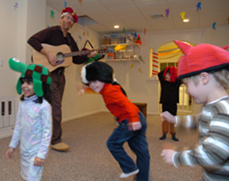 Robert uses fun warm-up exercises to coax children into gradually shedding their inhibitions and participating in the show. Do you have a daughter or son who loves to be in the spotlight? If so, this is your party!